And they say athletes and "kids today" are soft. 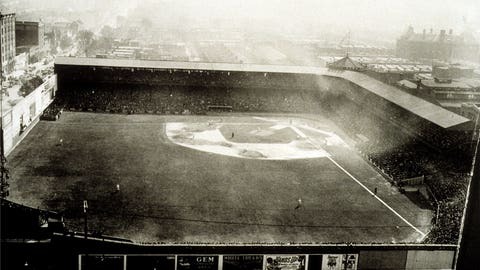 In what apparently is not a 100-year-old misprint or fabrication in the Oct. 23, 1915 edition of the Philadelphia Evening Public Ledger, an umpire called a baseball game that day because . . . the players were tired. 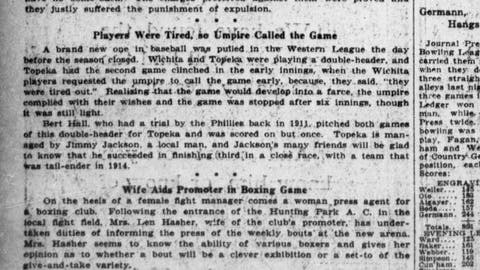 It happened during the second game of a doubleheader between the Wichita Wolves and Topeka Jayhawks of the Western League (now-defunct minor league) on the final day of their season. The line "a brand new one . . ." seems to indicate that our baseball forefathers were taken aback as well. I have no idea what kind of obligations the "tired out" Wichita ballplayers may have had outside the diamond, but instead of stopping the game the umpire should have ejected the entire team at the same time in the most glorious "YOU’RE . . . YOU’RE ALL OUTTA HERE" fashion possible.